Boye was a war time Norwegian international who joined United whilst stationed in the area during WW2. He turned out for United regularly over the next eighteen months until he was posted South in January 1945. He returned to play twice before returning home to Norway. A few months later it was reported that he was back in the UK playing with Exeter City. 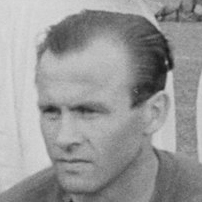 After the war, he joined Lyn and won the Norwegian Cup in 1945, and twice won the Norwegian Premier League in 1953 and 1955, before joining Larvik Turn and winning the league a third time in 1956. He was a member of the Norwegian squad that competed at the 1952 Olympics and over his entire career he played for Norway 58 times, scoring 4 goals. Boye was born on this date in Stavern, Vestfold, Norway.